Warm weather and the sight of seedlings in the greenhouse prompted me to get making some compost from the detritus in the chicken coop. The chickens are spending most of their time out in the orchard again now, which meant I could get into their corner of the barn this afternoon and remove a barrow-full of shavings and droppings from underneath their roosting area. 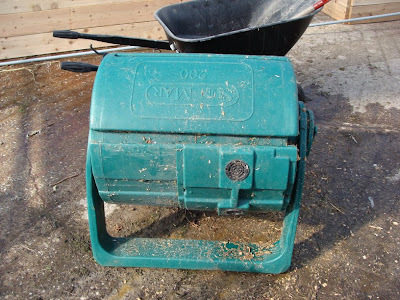 We obtained a rotating composter from a County scheme two years ago. I was never very satisfied with it as a means of turning kitchen waste into garden compost. This was my own fault, I think, for failing to supply it with enough moisture to do the job properly. My regular vertical plastic bins do a good job without needing any additional water, so I'd stopped using the rotating one. But it did occur to me recently that it might be a suitable container for turning the chicken waste into compost. The article from the Seattle Tilth site suggests that the proportions of brown to green material (i.e. 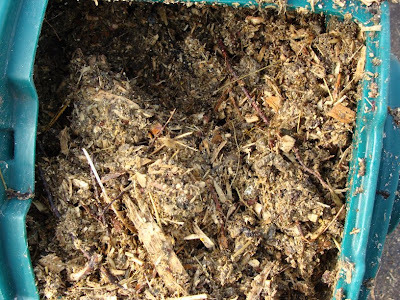 shavings to manure) in the mix should be 1:2, 1:1 or 2:1. I have to admit that I did not carefully measure the proportions (shocking, I know), but I suspect that it is more like 2:1 or even 3:1. I hope that in a month or two it will be in a fit state to add to the garden. *This is reminding me of one of my grandfather's jokes. Oh dear, can't resist sharing it. Woman to butcher: "Do you keep dripping?" Butcher: "No Madam, it's just the way I stand." Hope the compost works out. Great idea. Those are terrific planter beds and that is an amazing greenhouse!